Alan Fordham died on 12th October, 2005 aged 80 years. He came to FGS in 1962, initially to teach French and command the CCF with the rank of Major. Later, he was appointed Dean of the Sixth Form. 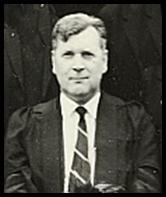 When FGS gave way to Farnham College in 1973, Alan stayed until he retired in 1984. Here is a report of his career compiled by Cyril Trust, OFA President. Alan was born on 24 March 1925. He joined the RAF from the Oxford University Air Squadron in 1943. He trained in Canada, flew in Australia and the Pacific, and was a member of the British Commonwealth Occupation Force in Japan. After the war he returned to Christ Church, Oxford to complete his MA Degree in Medieval and Modern Languages, and he was granted a permanent commission in the RAF in 1951. Following a variety of flying, command, and staff appointments, he retired from the RAF with the rank of Squadron Leader and joined the Farnham Grammar School. Alan Fordham's funeral took place at Aldershot Crematorium on 21 October 2005. The service was led by Rev. John “Slasher” Innes, who shared with those present that Alan was born in East Ham and joined the RAF aged 20. One of his heroes was T. E. Lawrence, which explains why his house was called "Clouds Hill". Several former members of staff attended the funeral including Mr Owen (physics), Betty Morris (biology), Sheila Walker (history) and John McLaughlin (sometime posing as a geography master). I'm sure we all remember "Henry's" lessons accompanied by the refrain "Fordham Boredom Blah Blah" to the tune of the Osmonds' "Crazy Horses". From memory, his nickname (allegedly) came from his "similarity" to an illustration of Henry the Navigator in an obscure school textbook although someone out there may be able to offer the correct story!